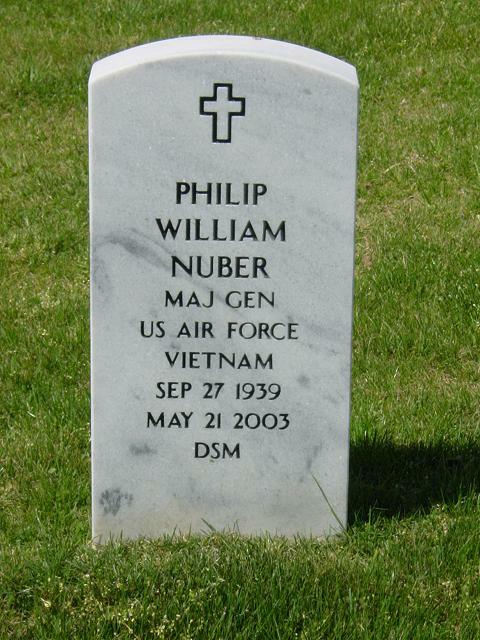 Major General Philip Nuber, United States Air Force (retired), 63, of Kent, Washington, passed away from cancer at home surrounded by his wife and children early on the morning of May 21, 2003. General Nuber, son of Carl and Harriet Nuber, was born and raised in Bozeman, Montana. He graduated with a Bachelor of Science degree from Montana State University in 1962 and was named one of their top 100 graduates during the MSU Centennial Celebration. He was a member of the Sigma Chi Fraternity. Phil was married to the former Maureen Jill Pepper in March of 1962 and then entered the U.S. Air Force through the Air Force Reserve Officer Training Corps program, earning pilot wings at Williams Air Force Base, Arizona in June 1963. He had more than 4,200 flying hours and was a veteran of 300 combat missions. Phil was a pilot at heart and commanded at squadron, group and wing levels. He served as the Wing Commander at Eielson Air Force Base in Alaska where he was promoted to Brigadier General. Other assignments included Deputy Commander, Joint Task Force, Middle East, aboard the USS LaSalle; Assistant Deputy Under Secretary of the Air Force, International Affairs, Air Force Secretariat, Washington, D.C; Chief of the Office of Defense Cooperation in Turkey; and, Director of the Defense Mapping Agency, with headquarters in Fairfax, VA. After his retirement from active duty in 1996, Philip was named Director of Business Development Space and Communications of the Boeing Company. He is survived by his wife Jill of Bozeman, Montana; son, Gregory of New York City and daughter Jennifer Atkin and husband Robert of Arlington, Virginia; mother Harriet of Kent, Washington; brothers Charles Nuber, of San Antonio, Texas; James Nuber of Huntington Beach, California; sisters Karlene Hughes of Arlington, Virginia; Jean Spaulding of Mill Valley, California; and Mitzi Gligorea of Gillette, Wyoming; and grandchildren Spencer and Sabrina Atkin. A memorial service will be held on June 11, 2003 at 9 a.m. at the Old Post Chapel, Fort Meyer, Arlington, Virginia, followed by an interment service at Arlington National Cemetery. Major General Philip W. Nuber was director of the Defense Mapping Agency, with headquarters at Fairfax, Virginia. A major combat support agency of the Department of Defense, the Defense Mapping Agency provides support on matters concerning global geospatial information and services to the Office of the Secretary of Defense; the military departments; the chairman, Joint Chiefs of Staff and Joint Staff; the unified commands; and the defense agencies and other federal government departments and agencies. The General was born in Bozeman, Montana. He entered the Air Force through the Air Force Reserve Officer Training Corps program in March 1962, and earned pilot wings at Williams Air Force Base, Arizona, in June 1963. He has more than 4,200 flying hours and is a veteran of 300 combat missions. He has commanded at squadron, group and wing levels and served as deputy director for operations, Office of the Deputy Chief of Staff, Plans and Operations, Headquarters U.S. Air Force, Washington, D.C.; deputy commander, Joint Task Force, Middle East, aboard the USS LaSalle; and assistant deputy under secretary of the Air Force, international affairs, Air Force Secretariat, Washington, D.C.
1. May 1962 - August 1963, student officer, undergraduate pilot training, 3526th Student Squadron, ATC, Williams Air Force Base, Arizona. 2. August 1963 - May 1964, student, U.S. Air Force operational training crews, F-100, 4527th Combat Crew Training Squadron, Tactical Air Command, Luke Air Force Base, Arizona. 6. March 1968 - March 1970, instructor pilot, F-5A/B, 425th Tactical Fighter Training Squadron, Tactical Air Command, Williams Air Force Base, Arizona. 9. April 1972 - August 1972, aircraft commander, A-7D, 357th Tactical Fighter Squadron, Tactical Air Command, Davis-Monthan Air Force Base, Arizona. 10. September 1972 - March 1973, chief of safety, 333rd Tactical Fighter Training Squadron, Tactical Air Command, Davis-Monthan Air Force Base, Arizona. 11. March 1973 - September 1974, flight commander, A-7D, 333rd Tactical Fighter Training Squadron, Davis-Monthan Air Force Base, Arizona. 13. October 1975 - July 1976, assistant operations officer, 358th Tactical Fighter Training Squadron, Tactical Air Command, Davis-Monthan Air Force Base, Ariz.
14. August 1976 - May 1977, chief, standardization and evaluation, 355th Tactical Fighter Wing, Tactical Air Command, Davis-Monthan Air Force Base, Arizona. 15. May 1977 - August 1978, operations officer, A-7D, 354th Tactical Fighter Squadron, Tactical Air Command, Davis-Monthan Air Force Base, Arizona. 16. August 1978 - December 1980, chief, Officer Assignments Division, Headquarters Tactical Air Command, Langley Air Force Base, Virginia. 17. December 1980 - July 1982, commander, 425th Tactical Fighter Squadron, Tactical Air Command, Williams Air Force Base, Arizonz. 18. July 1982 - September 1982, assistant deputy commander for operations, 405th Tactical Training Wing, Luke Air Force Base, Arizona. 19. September 1982 - September 1984, deputy commander, then commander, 833rd Combat Support Group, Tactical Air Command, Holloman Air Force Base, New Mexico. 21. July 1988 - January 1989, deputy commander, Air Force Combat Operations Staff, deputy director, operations, directorate for plans and operations, Headquarters U.S. Air Force, Washington, D.C.; deputy director, Office of Military Support, Headquarters U.S. Army, Washington, D.C.
23. July 1989 - September 1992, assistant deputy under secretary of the Air Force (international affairs); the Pentagon, Washington, D.C.